Montgomery’s first Public Charter School officially has an opening date. School leaders announced LEAD Academy will open August 19th, leaving them with a few months and a lot to accomplish. LEAD Academy was first approved in February of 2018, but a lawsuit from the Alabama Education Association kept it from opening. On March 8th, the Alabama Supreme Court ruled in favor of LEAD Academy allowing them to move forward. With the lawsuit behind them, school leaders are working to have everything in place by their August opening. The school building off of Eastern Boulevard will undergo major renovations, they need to fill close to 20 teacher and administrator positions and they expect to have enrollment at close to 360 students. 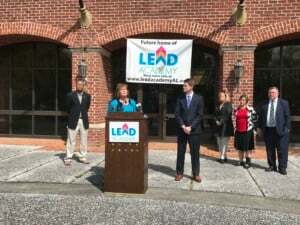 Many parents who planned to have their children attend LEAD Academy had to scramble when the opening was delayed last year because of the lawsuit. “I had to put my kids in a different program, like an alternative learning program. It’s been okay, but it’s been very costly for me, I really couldn’t afford it, but I didn’t have a choice,” explained Laura Tanveer. “We knew that there was definitely a desire among the folks in this community to have another option, so that is really what has driven us for the last year,” shared LEAD Academy Board Vice Chair Ryan Cantrell. Before the lawsuit halted their work, 150 students had registered in about a week and a half. Those parents will now have to re-register, and registration is now back open. LEAD Academy will start as a K-5 school and add a grade every year.